David Martin Scott Steel, Baron Steel of Aikwood (born 31 March 1938) is a British retired Liberal politician. 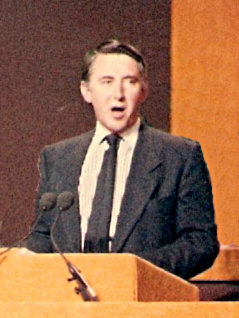 Steel served as the Leader of the Liberal Party from 1976 until its merger with the Social Democratic Party in 1988 to form the Liberal Democrats. He served as a Member of Parliament (MP) from 1965 to 1997 and as a Member of the Scottish Parliament (MSP) from 1999 to 2003. David Steel Facts for Kids. Kiddle Encyclopedia.